Dear God: Please make sure I fon-don’t make too many fondue puns in this article. Have you had fondue before? Fondue parties used to be all the rage, but these days, outside of a sketchy buffet chocolate fountain or a trip to an expensive chain fondue restaurant (yeah, those exist) most people aren’t eating fondue on the reg, which is too bad because there’s little else as fun or delicious as dipping food in cheese, chocolate or bubbling oil — it’s dinner and entertainment all rolled up in one. So let’s revive the fondue party. It’s simpler than it may seem, and is the antidote to stilted dinner party conversation. With this guide, you fon-won’t believe you fon-didn’t try throwing a fondue party sooner (I mean, I had to use at least a couple of fondue puns). Cheese: Cheese fondue requires a little more work than just melting cheese — but not much. An inexpensive white wine, a combo of shredded Emmentaler and Gruyère cheese tossed with cornstarch, and some low and slow heat are all you need to make the classic fondue. Check out Serious Eats’ foolproof cheese fondue recipe. Oil: Oil fondue involves actually cooking your food in hot oil. Oil is heated until very hot, then slivers or cubes of meat are dipped in and cooked in seconds. You can serve the meat with different dipping sauces once the meat is cooked. Naturally, Emeril Lagasse has an oil fondue recipe. Chocolate: Chocolate fondue is perfect for special occasions, and you don’t need to invest in one of those fountains to enjoy it. Simply melt chocolate, heavy cream and a pinch of salt together and start dipping — start with this easy recipe. 2. To slow cook or to simmer? What’s the best way to cook your fondue? There are a few different ways, each with their own pros and cons. Stovetop: On the stovetop, you can cook cheese, chocolate and oil fondue. For cheese and chocolate fondue, use a double boiler. This will ensure even and gentle heating, which will prevent cheese fondue from separating or scorching and prevent chocolate fondue from burning or seizing up. Oil fondue can be made in a sturdy, thick pot simply by heating the oil to about 375 degrees F.
Slow cooker: The slow cooker works well for cooking and serving chocolate fondue and for serving cheese fondue. For slow cooker chocolate fondue, add your ingredients to the slow cooker, then cover and cook on high for a half hour. Whisk the ingredients to combine, set the slow cooker to low heat or the warm setting, and get dipping. The slow cooker works well for serving cheese fondue, especially if it has a warm setting (the low setting on some models can still be too hot for proper cheese fondue, leading it to separate or burn). Simply cook your cheese fondue on the stovetop, then transfer it to the pre-warmed slow cooker for serving. Candle or Sterno: Using a fondue pot suspended over a candle or can of Sterno is the perfect way to serve cheese and chocolate fondue. They provide a gentle heat that keeps the fondue melted, but not overly hot, so you can enjoy dipping into your cheese or chocolate without worrying about lumps or scorching. You can probably find a classic fondue pot for this method at your local thrift store. Electric fondue pot: If you are truly committed to living that #fonduelife, you might consider investing in an electric fondue pot. This model does it all — it can both cook and serve cheese, chocolate and oil fondues. What to dip? Anything your little heart desires. For cheese fondue, try cubed bread (stale is traditional), blanched veggies and cooked meats. For chocolate fondue, try dipping fruits, cubes of cake and marshmallows. For oil fondue, try dunking thin strips or small cubes of beef, chicken, pork or shrimp served with dipping sauces. Horseradish cream, béarnaise and aioli are traditional, but try mixing things up with Vietnamese nam pla prik, Korean ssamjang or homemade Buffalo sauce, all of which taste delicious with fried meat. You can use specially made fondue forks for spearing your ingredients, but plain skewers work well too. If everyone at your party just eats a bunch of cheese-covered bread or deep-fried meat, they’re going to feel sick by the end of the night. Serve your fondue alongside some lighter dishes — a cool, refreshing salad, an ancient grain pilaf, some simply prepared veggies and lots of iced water are the perfect way to help balance out the indulgence. The best part of eating fondue? Other than the deliciousness, there is a whole bevy of rules to follow, which are more like games you play, to make fondue night feel like a party every time. There are fondue “punishments” you can decide upon ahead of time. Every time the food someone is dipping drops into the pot, they have to do something. 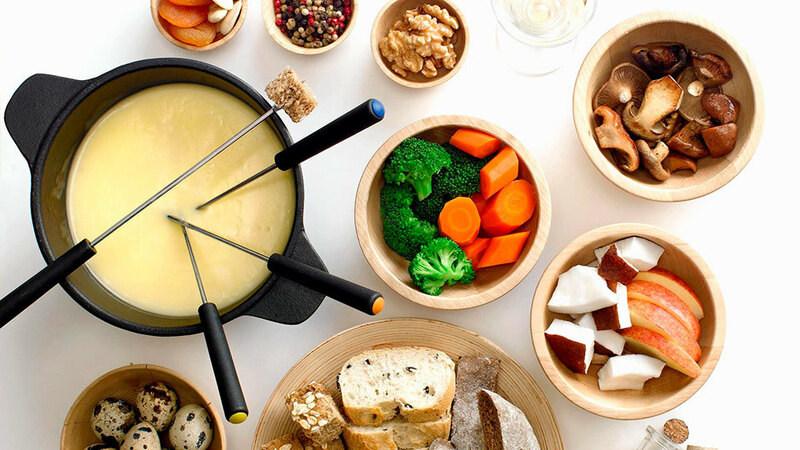 Whether they have to kiss the person on their left, sing a song, answer any question or do a dare, there are fun rules for any and every fondue party that make the experience about so much more than just eating.